It’s here—the time of year when a flurry of predictions are published and discussed for the New Year. It is also a time to reflect on all that transpired in the past year. At Workday, we feel this is a healthy and necessary practice to help our industry move forward. As such, we’ve proudly sponsored the wildly popular “Predict and Prepare” Webinar for the last four years. This year, on Dec. 7, we are fortunate to have industry experts Jason Averbook, Naomi Bloom, and R “Ray” Wang on a panel moderated by Bill Kutik. This esteemed panel will cover a wide range of topics, including Software as a Service (SaaS), unified HCM, mobile, social, and workforce analytics. Managers will engage in HR technology in ways we haven’t yet seen, primarily due to increased tablet usage in the enterprise. Business use of tablet computers, most notably the iPad® mobile device, is expected to significantly increase in 2012. Datamation reports on a Gartner Research prediction that by 2013, 80 percent of businesses will support a workforce using tablets. Since delivering the Workday for iPad® solution, we have seen how its unique design features and capabilities are redefining how users interact with our enterprise solution and collaborate with one another. It is the perfect tool for managers, because it’s easy to use and lets them quickly accomplish tasks. We believe that’s going to drive a significant increase in tablet use for HR-related business processes, making it possible for customers to get much closer than ever before to comprehensive manager self-service. With greater adoption of tablets for HR functions will come more contributions, allowing more data to be captured and reused, thereby increasing the collective workforce intelligence. In turn, that newly captured intelligence will enrich every decision point within organizations. This is a very exciting time for HR technology—these devices have opened up a new channel to offer operationally relevant content in a natural workspace for business users. 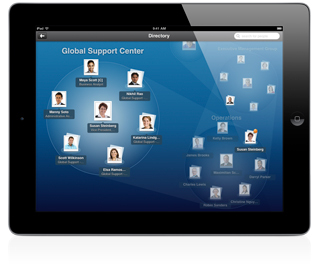 In 2012, Workday will continue to design new and powerful manager and executive experiences for the iPad. Happy holiday season, and cheers to a productive and empowering 2012.